It’s time for CLEUR again, for the second year in Berlin, that’s 5 years in a row and I still get excited when the date arrives. I won’t repeat many consideration’s I’ve already made last year. 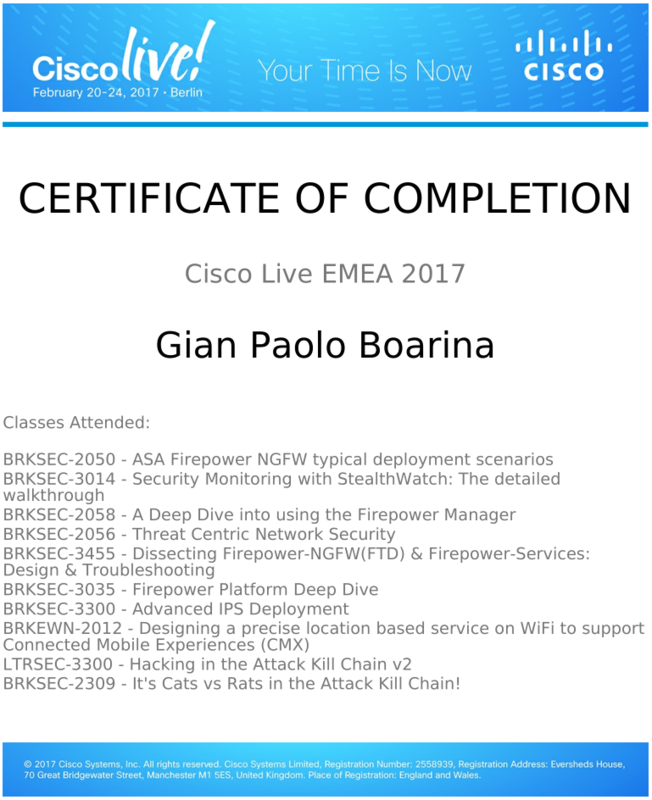 This year my main focus was security, I attended many FirePower, AMP and FTD sessions. General routing/switching and wireless are topics I can see in other partner events or learn by myself watching recordings later. After spending some time with Kali Linux I really think Hakan Nohre, Chung-wai Lee and Erkan Djafer did an awesome job putting up this lab. I can’t wait to go home and start a couple of VMs with Windows and Kali to try more scenarios. Cisco Live is a tough week that leaves you with smoking brain and feet smoking but it really worth it. Next year is Barcelona, I hope for a better weather (and food ;-) ).